Chicago, IL – September 5, 2017 – Since treating their first pet with cancer in 2015, PetCure Oncology has been working tirelessly to care for more pets – and a wider variety of pet cancers – than what was previously possible with traditional cancer care techniques. 8-year-old Sydney is one of many pets that has benefitted from accessibility to SRS through PetCure Oncology. Less than 30 months later, PetCure Oncology is proud to announce that its 1,000th patient was treated on Tuesday. Sydney, an 8-year-old Boxer mix from Indianapolis, received stereotactic radiosurgery (SRS) for a tumor affecting her central nervous system. 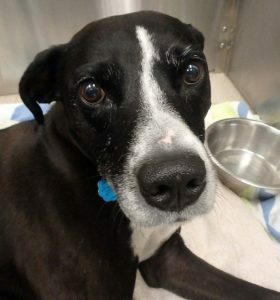 Sydney is receiving care from PetCure Oncology at Care Center in Cincinnati, Ohio, one of the few facilities capable of providing SRS for pets. Just over two years ago, PetCure was founded by a frustrated pet parent determined to provide pets with access to the same advanced cancer treatments available to humans. That mission has led to the integration of SRS into veterinary medicine, providing pet owners across the country with access to advanced radiation therapy delivered with sub-millimeter precision unprecedented in veterinary medicine. Of the first 1,000 patients treated by PetCure, nearly 70 percent have benefitted from SRS. Pet owners are electing this potentially life-saving treatment because of its significant benefits over conventional radiation therapy or surgery. SRS, which can target some tumors previously considered “untreatable” by radiation, typically results in improved quality of life and minimal side effects. It is delivered in just 1-3 treatments, an 80-95 percent reduction in both treatment sessions and anesthetic events, leading to decreased risk for the pet patient and increased convenience for the pet owner. 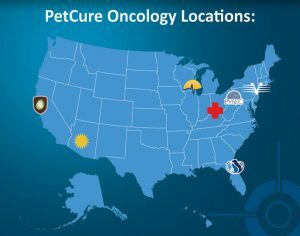 With the most experienced network of board-certified veterinary radiation oncologists in the country utilizing the most advanced technology available, PetCure Oncology is making a meaningful impact on the lives of pet families from coast to coast. PetCure has further bolstered its support of pet owners by forming a Pet Advocate Team that is exclusively dedicated to helping owners of pets with cancer. Pet Advocates are easily reachable by calling 833-PET-HERO or visiting PetCureOncology.com.